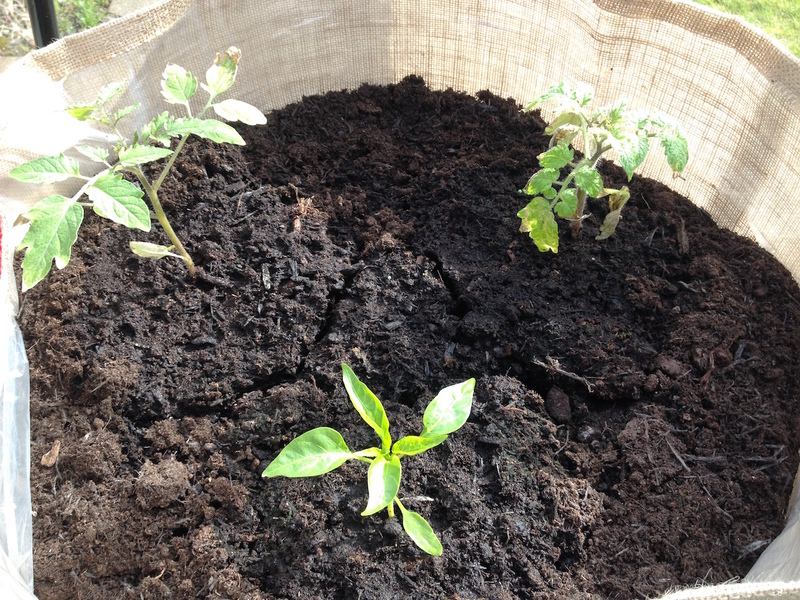 One is a cherry tomato plant, hence the smaller size. I actually thought they were both cherry tomatoes but now I’m not so sure. There’s a bean shoot growing in there too. 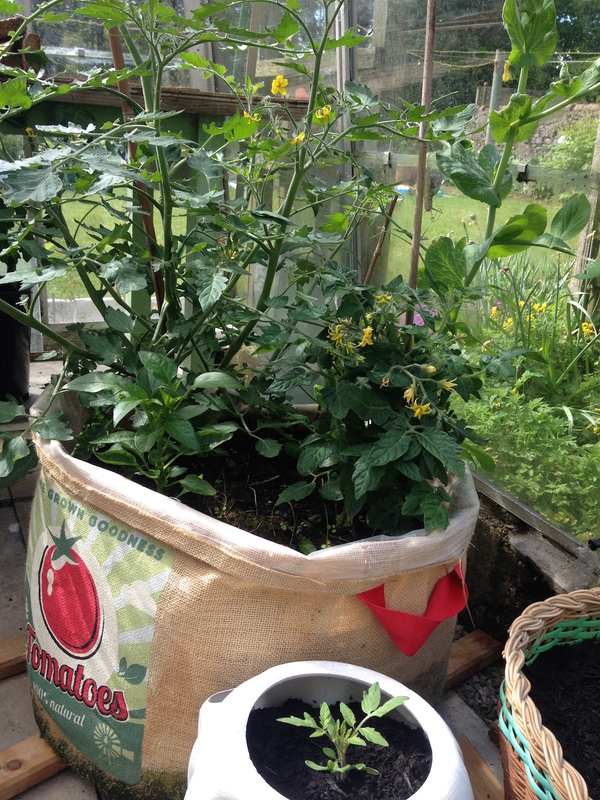 I’ve probably got too many things in that one sack but they seem to be doing well and I can see the beginnings of small tomatoes at last. That’s not bad for a climate where most days are about 10 or 11 degrees celsius. Those are sunflowers on the left in that last photo. I’m not sure what to do with them. I didn’t mean to end up with so many and I think it’s too cold here to put them outside in the garden but they’re getting really tall. Once upon a time people used to view daffodils as weeds too. 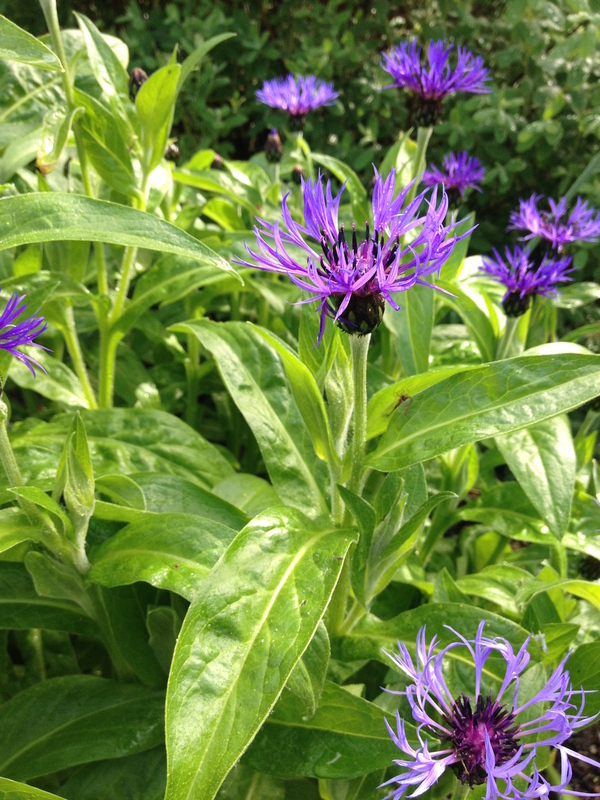 I’ve also got what I think are perennial cornflowers which I think some people regard as weeds but I love them. Posted in Journal and tagged beans, cornflowers, cucumbers, floweres, gardening, kale, poppies, sunflowers, vegetables. Bookmark the permalink. Herbs grow well on a window sill if you’re looking for something to grow. A pot of basil in the kitchen is also really handy for cooking. Oh dear! That’s not good. Did you say anything? People are so obsessed with lawns but they’re such a boring monoculture and require frequent mowing. They don’t do anything for birds, butterflies, and bees either. I can’t understand it. Looks great. My heart sings! Your plants look so healthy. 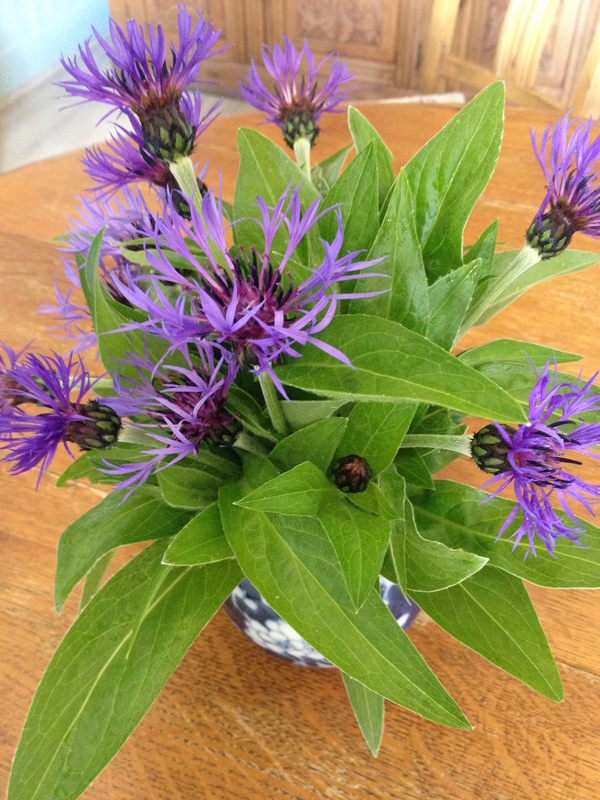 I wish poppies and cornflowers grew like weeds in my garden! Thanks! I think we are automatically attracted to things we find exotic. Probably the people here would love to have your weeds since they would be unusual to them. Loads of poppies here of all colours, except the blue Himalayan ones. Sunflowers should be OK against a south facing wall or fence, it’s fun watching them follow the sun round. But don’t blame me if they fail, but they can grow big! I don’t know what part of Scotland you’re in, but here in mid-Wales we’ve loads of sunflowers and they grow really well and very tall. 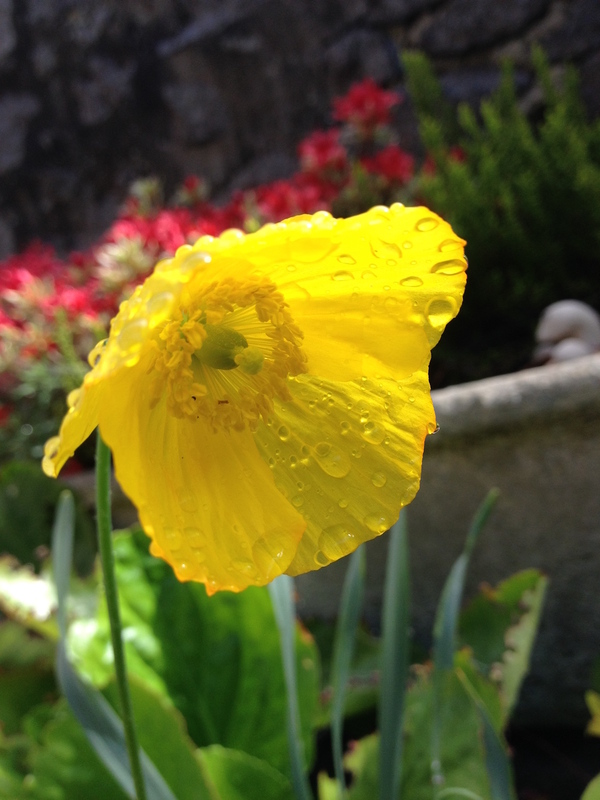 The yellow flower is a Welsh poppy, if I’m not mistaken – had loads of them when I lived in London but now in Wales, they look more in place! And we have the same cornflowers (I think that’s what they are) but every time I try to take their picture they say, “we don’t want to be photographed, we’re going to shed our petals now.” Kale. 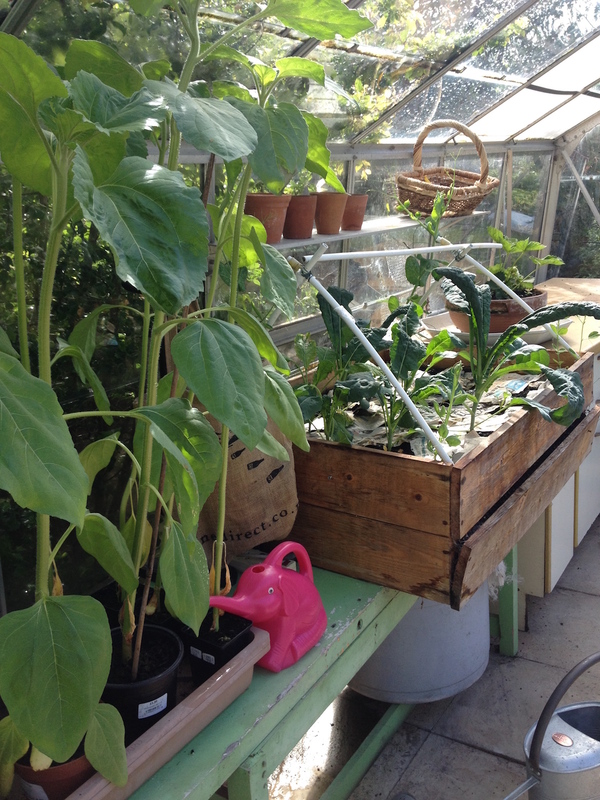 Now that’s an idea for our greenhouse. Good luck with your tomatoes and strawberries. I’m way up north in Aberdeen and I did just yesterday plant one of the sunflowers out in the garden. If it survives I’ll put the others in the garden as well.